A book-lovin' friend of mine from church offered to loan me her copy of The Capture , which is the first in the Guardians of Ga'Hoole series. This friend of mine seems to be a discerning reader (heh) and so I took up her offer and read the book. It took about two days for me to make my way through this title as I found it to be completely riveting. If you are as unfamiliar with these books as I was, Guardians of Ga'Hoole is a middle grade fantasy series consisting of 15 total books written by Kathryn Lasky. (There are apparently spin-offs and side plots but there are 15 books in the main series.) I will avoid saying much about the series as a whole because there are so many spoilers that can be offered and I do not wish to spoil it for myself as much as you. To date, I have only read the first title. In The Capture we meet Soren, who is a young barn owl who lives with his family in the kingdom of Tyto. As the book opens he is experiencing life has a young owl who is anticipating his first meal and learning how to fly. Unfortunately, disaster befalls Soren and he is captured and taken to St. Aegolius Academy for Orphaned Owls. There, Soren meets another young owlet named Gylfie. The two of them are well aware of the fact that neither of them are true orphans and they determine between themselves to learn to fly in order to escape their current prison. They also make it their personal mission to move throughout the facility and discover what is truly going on behind the scenes so that they can tell their family about this mysterious place. As the story unfolds more clues are revealed. The book ends with a dangling question mark (of course!) and you must read further to understand what is happening in total. I have to say that I wasn't really sure what to expect from this book when I first launched into it. However, I was quickly sucked into the story. It is very reminiscent of Nazi brainwashing tactics during World War II. 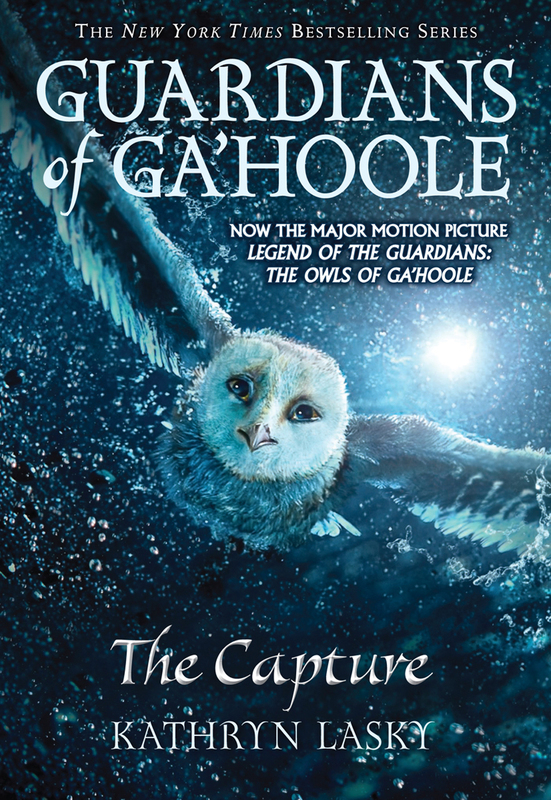 In Guardians of Ga'Hoole, the owlets are all made to force march under the light of the moon causing them to be "moon blinked." In this manner, the owlets forget their homes and families and are easily trainable to fulfill the wishes and commands of some unknown behind-the-scenes power (who is not revealed in Book 1). There is a library at St. Aggie's, but it is completely off limits to the owls. Books go in but they do not come out and no one is allowed to read for themselves. The owlets are also not allowed to ask questions but must do as they are told. Finally, there is talk of building a master owl race that is superior to any which have existed before. It is all quite fascinating. I'm not quickly drawn to series of books which feature animals as the main characters. (Even as I type that I'm reviewing titles featuring animals in my mind which I have liked in the past such as this one and this one.) Let's just say that owls aren't very appealing as main characters in my mind and so I was doubtful of my ability to connect. Whatever my doubts were, Lasky quickly dispelled them. I had no troubles whatsoever diving into a world in which owls are being re-programmed, as it were, to accomplish some great mysterious mission. I am excessively curious to read further into the series. In fact, I am so curious in fact that I purchased the fifteen books immediate in the Guardians of Ga'Hoole books. A conservative reader alert should include warning that there is some strong language used. I think I recall a word (such as "stupid" or "darn") within the story. Unfortunately I can't remember the specific word but I do recall running across it and thinking that I wish it had been toned down just a bit further so that I could rest in the knowledge that the book was as clean in the language department as could be. Obviously I didn't find it to be a horrendous road block because I can't even remember what the word is but merely that it existed somewhere. My second reservation about the book (if you can call it a reservation at all) is that it is bloody. There is one rather grisly death scene and then there is a ritual in which some bats come and "remove the desire" of the owls to fly which involves some biting and blood. It is a little mentally disturbing and it would caution me against turning this series over to too young of a reader. The above stated, I did purchase the books with the intent of gifting them to my oldest son for Christmas this year. He'll be slightly over seven when he receives them. I know that these books are within his reading capabilities in terms of skill level. I also anticipate that he'll find the books very exciting and therefore I think they are a good fit. My husband and I sat down to watch the movie which is based on these books after I had finished reading The Capture . I quickly discovered that the movie covers more than just Book 1 so we didn't finish watching it. I have since been informed that you should read the first three books in the series before attempting to watch the movie. So I'll hold off and finish watching it later. In short, based on my reading of the first book in the series, I think Guardians of Ga'Hoole is a fascinating series! It certainly has captured my imagination and I'm looking forward to reading on further. Thanks, S, for loaning me the first book and getting me started! I'm always looking for new series for Kyle, so good to hear. I'm not sure what his thoughts are on animal books either, but I'll suggest this one to him. I'm trying to decide when to start him on MBS. He'll be a 4th grader, so I know I'll put it in his hands sometime this year, but I want to be sure he really really gets it. I'm going to try this on Deux. I read one once a while back and was more confused than impressed, but that was probably because I picked one up in the middle. O:-) Anyway, Deux is starting to want to read longer books but is not finding Duchess's endless piles of American Girl books to be a good fit. :-D Maybe he will enjoy this. I'm also going to see if they both like MBS yet. I remember reading book one and loving it and then forgetting to read the rest. : ) I have 1-4 on the shelf so I may have to get back to these. Your thoughts remind me about how I felt about the first Redwall book which I just read. (Have you read the Redwall series?) I have only read book 1 and loved it, thought it is no Tumtum and Nutmeg. The mice are in battles quite a bit and several die. I see it as a perfect book for an older grade school boy (or even N1 if she was interested in reading it). I think I might have my girls give these a try! I'll have to borrow one from our library and see if I think the kids would like it. I'd not heard of this series - sounds interesting! Uggghh! Carrie! This sounds fascinating, but there are FIFTEEN of them, and if I start them I'll have to finish them. I think this is a series to put off till I'm all moved.